A fast growing and exotic-looking climber, with large deep purple flowers from July to October. 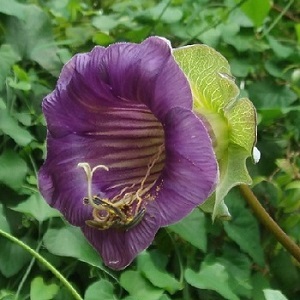 The flowers are bell-shaped with an attractive fragrance. Plants have tendrils which help them climb up walls and trellises, to a height of about 4m. Plants grow quickly – and sowings in early spring flower the same year and cover a large area. RHS Award of Garden Merit. Cobaea grows best in a sheltered place with full sun – a south or west facing wall or trellis is ideal. Soil should be moist and well drained. Plants will grow well in big pots with plenty of water. These are perennials and will survive many years if protected from frost – they make good conservatory plants and will flower into early winter in a sunny conservatory. Pack of 10 seeds. Sow in winter/spring for summer outdoor flowering, or spring to summer if keeping indoors overwinter. Sowing instructions and a colour photo are printed on the packet. Conditions Sheltered place in full sun with moist well-drained soil. Sow in winter/early spring for summer outdoor flowering and spring to autumn for next year flowering. Sow the seeds vertically in small pots of seed compost. Cover with 2mm with compost and keep at 20 –22°C. Germination takes 3-4 weeks. Transfer seedlings to bigger pots when big enough to handle. Harden off seedlings before planting out. Grow Plants can be removed entirely in the autumn or moved indoors before the first frost, where they will survive the winter if protected from frost. If you plant to keep the plants over winter, they can be trimmed after flowering, removing long unruly stems and older woodier stems. Protect plants indoors from spider mites.